In our project, we must construct 3 functional bacteria—the sensor, transmitter, and effector totally. In addition, we also design the multi-promoter and find a new cell communication molecule. In the sensor, we set up 2 gene lines. For the first gene line, we put the lacI gene under the control of a constitutive promoter and use pLacI regulating the expression of luxI. 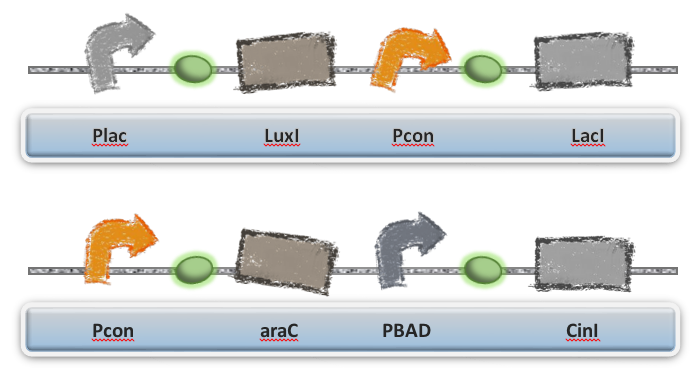 For the second line, we put cinl gene under the control of pBAD and use a constitutive promoter regulating the expression of arac. We make the use of IPTG and arabinose to simulate the 2 changes of outside environment. When IPTG are administrated in media, sensor will be stimulated and express luxl, which could induce the formation and secretion of AHL. On the other hand, when we add arabinose into our system, it will make sensor express Cinl, which could promote bacteria secrete 12C-HSL into media. Then, AHL and 12C-HSL will be accepted by transmitter. In the transmitter, there are 2 independent gene lines correspondingly. For the first line, we link the genes which could express the LuxR and RhlI proteins and then keep them under the control of pLux. For the second line, there are 3 genes (LasI, PpyS, and CinR) under the control of pCin. So you see, when the sensors are stimulated properly, the LuxI/Cinl/LuxI+Cinl are secreted by the sensors and the transimitter could express and secrete the RhlI/ PpyS+LasI/RhlI+PpyS+LasI respectively into media. Actually, there are several well-differentiated bacteria to execute different function in the effector group. Up to now, we design 3 bacterium colonies. The first colony, we make a constitutive promoter regulate the expression of RhlR and mRFP1 is under the control of pRhl. The second colony, we use a constitutive promoter expressing the ptrotein LasR and RhlR and the expressing of GFP is controlled by a multi-promoter which is activated by RhlI+RhlR but inactivated by LasI+LasR. As for the final colony, we use the new cell communication system we find in Photorhabdus luminescence. 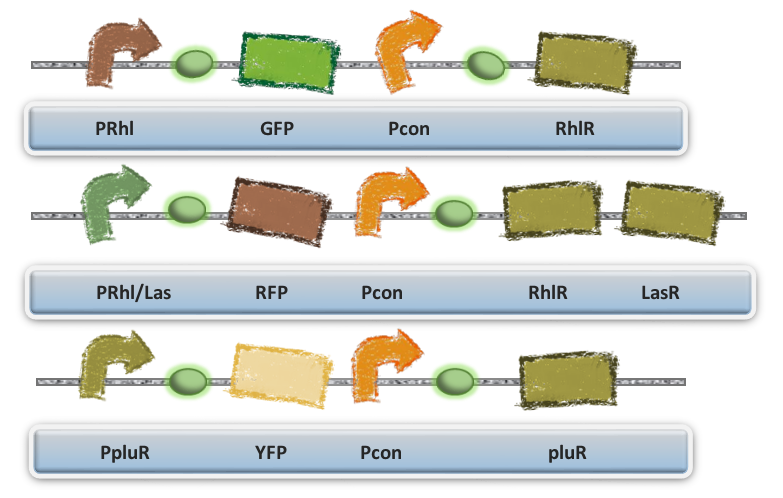 The protein PluR is expressed by a constitutive promoter and the amilcp (a kind of photopsin with green light) is controlled by pPlu.